Selecting the best kitchen countertops for your home is always a tough decision. There are a wide range of products on the market to choose from. And this makes narrowing down your list of options a bit difficult. With a bit of research, you can empower yourself with the knowledge it takes to pinpoint a handful of materials that are best. 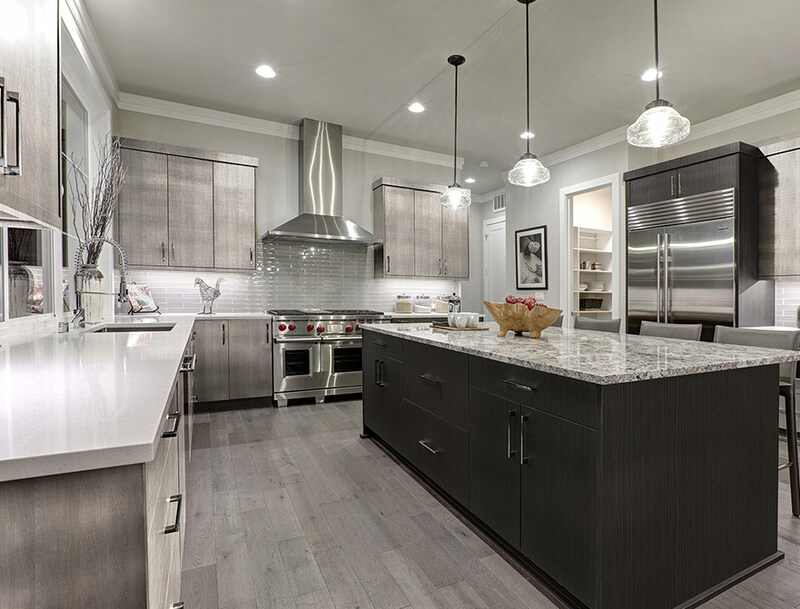 For the sake of this article, we narrowed down the kitchen countertop options to the most popular – granite, solid surface and engineered quartz. You’ll find this commonly used in residential kitchens throughout the nation. If you’re considering one of these surfaces for your kitchen counter, then continue reading. Let’s look at the differences and similarities between these three products. This is a great question because it will help determine the quality, longevity and durability of each kitchen countertop. With solid surface, you’re getting a surface that’s heavy-laden with polymer materials. These slabs are about 33% man-made polymers and 66% natural minerals. Quartz, on the other hand, is an engineered stone that looks much like natural varieties, such as granite and marble. It is made with 90% quartz and the remainder is made with resins and pigments. Some view quartz as the less fake option compared to solid surface slabs. Granite is the 100% natural material widely used for kitchen countertops. It’s harvested from the earth and then cut into countertop slabs. Nothing is added or removed from the contents of granite counters. There’s a lot of history behind these three countertop materials, however, we’ll focus on the key aspects of each. Solid surface countertops were developed by brands like Dupont and Corian. The purpose of its creation was to provide an alternative to laminate countertop materials. After Dupont’s patent expired, many other brands came out with their own versions of solid surface countertops. Engineered quartz was first created by Bretonstone, an Italian company. It’s now currently licensed for production by 52 other companies. Many still use the original brevetto slabs. Since granite is a naturally-occurring stone, no one can really take the credit. It’s currently mined from various locations around the world, including China, Brazil and India. After a being mined, the stone is shipped to America for the fabrication. In the past, granite stone was mainly found inside of mansions of the rich. Today, you can find it in homes of all demographics. It seems engineered and natural stone countertops will forever be a trend. Some years, they’re more popular than at other times. The first-time solid surface became popular was in the 1980s. Currently, there weren’t many other options to choose from that were functional and reasonably-priced. Quartz tends to be the trendiest of all the stone kitchen counters. It’s the standard for many new home constructions today. Granite too remains a popular choice among homeowners and home builders due to its quality and aesthetic appeal. Now, this is where it gets easier to determine which is best for your kitchen design. Solid surface counters have a uniform and matte look. However, you can buff it to have a glossy appearance if you wish. The only problem with making solid surface glossy is that it makes scratches easier to see. Quartz kitchen countertops are lustrous, deep and 3-dimensional. You can make it glossy or have a matte look. It also comes with a homogenous look. Granite has rich, lustrous and crystalline. You have the option of either honing or glossing the surface. It’s much different than the homogenous appearance of quartz. The look of a kitchen countertop is one thing – how it feels is also relevant. If you’re like some homeowners, you want a surface that’s smooth to the touch. With solid surface, you get a matte soft feel that’s much like a soap bar. Scratches are bound to appear on the surface, which also contributes to the matte-look. Quartz is also smooth, but has a glossier tone, just like granite stone countertops. Some homeowners find countertop seams annoying visually and functionally. Solid surface counters have the fewest visible seams of the bunch. This is because the seaming caulk attaches perfectly with the slabs, making them nearly invisible. Quartz counters have visible seams, but the installer can hide them. The same goes for granite stone. With the above information, you can get a better idea of which of the three stone countertops are right for your kitchen. Also, it helps to see the slabs in person. Therefore, it’s recommended that you visit a local showroom. We have one here at KNC Granite. You can stop by our showroom to view the various natural and engineered stone slabs we have available. This includes granite, marble and quartz. We carry stone slabs from leading brands like Cambria, Silestone and Caesarstone. Our licensed professionals can both fabricate and install the countertops into your kitchen. We will come to your property to take measurements to ensure you get the proper fit. We take pride in the craftsmanship of our installations to ensure each of our customers are satisfied. Our products also come backed with brand warranties. KNC Granite services multiple areas in Virginia, including Annapolis, Bethesda, Arlington, Washington DC and Rockville. If your kitchen needs a countertop upgrade,then give KNC Granite a call. Contact us now to get start with your free estimate!